Florida State Parks are in various stages of accessibility, and are working to improve access to services and facilities. Should you need assistance to enable your full participation, please contact the individual park office as soon as possible. Sometimes as many as ten days may be needed to schedule a particular accommodation. Florida state parks are open from 8 a.m. until sundown 365 days a year. Pets are not allowed in camping areas, on bathing beaches, in concession areas and may be restricted in other designated areas of the park. Where pets are allowed, they must be kept on a six-foot, hand-held leash and well-behaved at all times. Service dogs are welcome in all areas of the parks. To discover and experience all of the Real Florida at Florida's 145 state parks, ask a Park Ranger where you can pick up a copy of the Florida State Park Guide, or call 850/488-9872. Adjacent to busy Port Everglades is a beachfront park that preserves some of south Florida's vanishing natural resources. Beyond preserving them, the Florida Park Service is actively restoring natural areas that were damaged by earlier users. John U. Lloyd Beach is 251 acres of barrier island between the Atlantic Ocean and the Intracoastal Waterway, from Port Everglades on the north to Dania on the south. Its natural setting contrasts sharply with the urban development of Ft. Lauderdale. The recreation area was named in memory of the late John U. Lloyd, Broward County's attorney for more than 30 years, who was instrumental in acquiring the first piece of property that eventually became this park. A paved, lighted jetty at the north end of the park provides excellent fishing and an opportunity to view ships arriving and departing from Port Everglades. 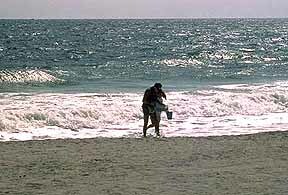 On Florida's east coast, wave action erodes beaches located south of jetties. At Lloyd Beach, offshore sand is pumped onto the beach to replace what washes away. Changed beach sand can cause problems for nesting sea turtles. Lloyd Beach, one of Broward County's most important sea turtle nesting beaches, produces some 10,000 hatchlings a year. When necessary to prevent them from washing away, turtle eggs are sometimes moved to a protected hatchery. The park's broad, flat beach is popular for swimming and sunning. When driving on the beach was banned, sand dunes, anchored by sea oats and other rare beach plants, began to reform. Shaded picnic areas are located along the beach. Limited picnic supplies, as well as bait and rental canoes, are available at Coco's Cafe, the park's refreshment stand. A tidal waterway, called New River Sound or Whiskey Creek, divides the park along its length. It is a protected zone for the endangered manatee and a great variety of other marine life. The mangrove-lined waterway is a scenic place to canoe, observe bird life and take photographs. Further inland are stands of subtropical coastal hammock (seaside hardwood forest). A self-guided trail offers a leisurely 45-minute walk through the hammock. Non-native plants are regularly removed from this area. Removing these "exotics," such as Brazilian pepper and Australian pine, is a long-term process throughout the park. On the west side of the park, along the Intracoastal Waterway, a man made wetland is bringing back red mangroves to the shore. The mangroves not only screen the view but provide a rich nursery ground for fish and other sea life. The wetland is a mitigation site to replace wetlands destroyed by Port expansion in 1989. John U. Lloyd State Recreation Area is located in Dania, off A1A.